Optional return to Los Angeles. Enjoy the beautiful San Diego, view the amazing sites, enjoy a boat tour, climb Mt Jacinto by tram then hike in Coachella while in Palm Springs, take pictures make friends and have a great time and then enjoy the fun of Las Vegas. Heading through the mountains towards the oasis which is Palm Springs, we head to the Palm Springs Tram and climb Mt. 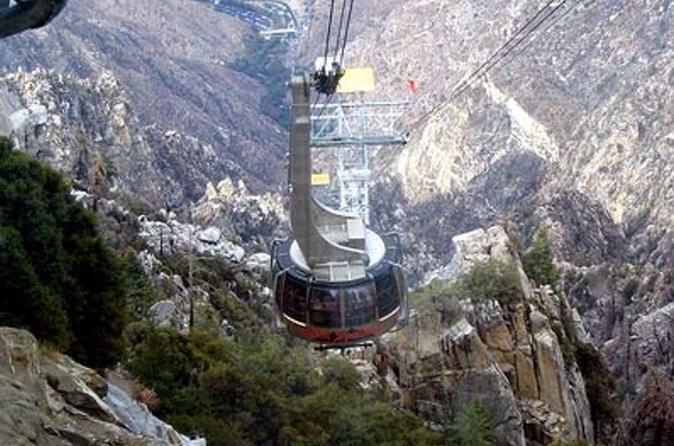 Jacinto on a rotating tram and enjoy the spectacular views, we drive up 2000 ft then climb another 8000 ft with the tram (no stress), there is optional eating at the top of Mt. Jacinto or a picnic at the Thousand Palms Oasis Preserve in the Coachella Valley Preserve where we will go on a nature trail hiking, easy 1 mile hike to the San Andreas fault and step on the most menacing fault in the United States, this is earthquake country, the oasis are clustered along the San Andreas fault where springs are formed from the gaps in the earths plates. Mind blowing, after spending at least 3 hours here we head to our hotel in and tomorrow on to sin city, Las Vegas- woo-hoo. our first stop is at Joshua Tree Natiional Park.We pass by the famous Ivanpah Solar Plant, the plant has a gross capacity of 392 megawatts (MW). Amazing. We stop along the way for lunch. We stop at the Seven Magic Mountains in Jane, NV for foto opportunities, These Magic Mountains were created by the Swiss artist Ugo Nordinone. Seven pillars of huge, neon-hued boulders stretch up to the sky. They’re the only thing for miles around, “creative expression of human presence in the desert.” We continue on to the Fabulous Las Vegas. We end our tour at the renowned Excalibur Hotel and for those who want to head out on their own, we recommend checking our the main attractions on foot, the beautiful fountains at the Bellagio, the amazing Caesars Palace, the Venetian with the gondolas or you can book a show and enjoy any of the Cirque de Soleil or other attractions. Your Tour Guide can assist you in planning your evening.